Looking for San Francisco Tourist Information? 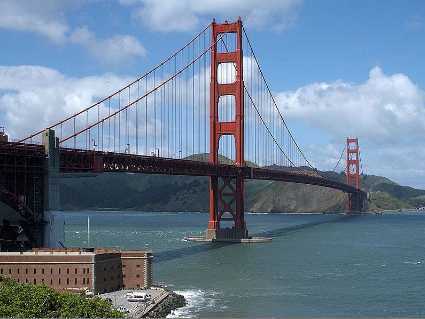 San Francisco is one of the most popular tourist destinations in California, USA. This beautiful city is roughly 7 miles x 7 miles, surrounded by water on three sides at the tip of a peninsula. It’s cultural diversity and rich history make it one of the best California vacation destinations. There is no other place in the world like San Francisco. Take a weekend getaway to this beautiful California destination! International tourists will be happy to know that you don’t need a car in San Francisco. This is a walking city, and if you need a lift, call Uber. Bring comfortable shoes, a good city map or your iPhone, and comfortable layers of clothing. During the summer San Francisco - or “The City” as it is called by locals, can be quite chilly, with a layer of fog hanging over much of the city. Surprising, during the winter, many days are quite sunny and warm. There is so many things to do in San Francisco. Here is some of the best San Francisco tourist information and tips on where to do and what to see for your San Francisco California vacation. You should also consider visiting nearby Napa Valley wine country. It is hard to describe the beauty of the San Francisco Golden Gate bridge. It is really an experience. Whenever I travel and come back to The City, seeing the bridge always warms my heart. Perhaps it is the beauty of the bridge, perhaps it is the fresh cool air, or the always changing views of the bridge - will we see the towers just peeking above the fog today, or get a full view against a blue sky? A vacation to San Francisco should always include a trip to see the San Francisco Golden Gate Bridge. Where is the Golden Gate Bridge? It is located between the Presidio area of San Francisco to Marin county. Highway 101/highway 1 crosses the bridge. You can drive across the bridge, bicycle across the bridge, or walk across the bridge. It is 1.7 miles (2.7 km) long. You can also stop and take some scenic photos from the Golden Gate Visitors Center, located at the last San Francisco exit before highway 101/highway 1 crosses the bridge. San Francisco wouldn’t be the same without Fisherman’s wharf. 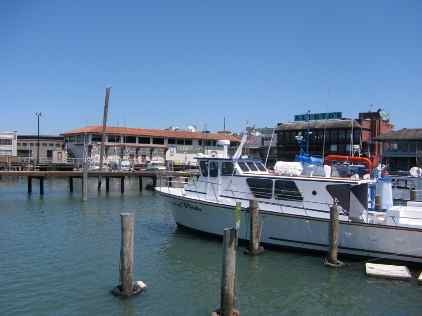 Here you can walk along the wharf and buy shrimp cocktails on the sidewalk, and check out the menus at the fine dining restaurants with stunning views of San Francisco Bay. Seafood is on the menu of course, and it is fresh and tasty. Stop by the Boudin bakery and watch them make the famous San Francisco sourdough bread. The flavor is unique to San Francisco and it is yummy. Upstairs you can also dine in their fine dining room. Near Fisherman’s wharf you can take a cruise on San Francisco Bay, or the Angel Island or Alcatraz. Advanced reservations are recommended on weekends and during the summer, as these trips can fill up fast. Since this is a popular tourist area, there are San Francisco tourist information brochures and maps available in this area. San Francisco is such a beautiful city, that it is worth taking a tour of the city. The 49 mile scenic drive is one option, but it takes a full day, and who wants to drive in traffic anyway. A fun option is to take a guided sightseeing tour. You can go San Francisco style in a motorized cable car tour. A 2 hour tour will take you to see many of the top attractions, including the Golden Gate Bridge, Ghiradelli Square, Palace of the Fine Arts, Nob Hill, Union Square, Marina district, and much more. sits in the middle of San Francisco Bay. This island has a rich history, most notorious was its time as a federal maximum security prison aka ‘The Rock”. 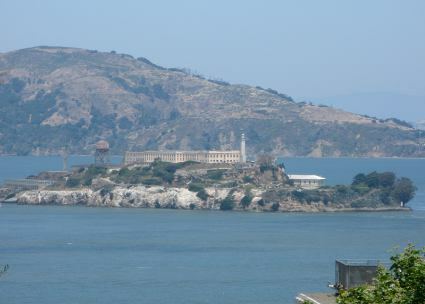 The island is now unoccupied and is run by the Golden Gate National Recreation Area as a museum. Tours to Alcatraz island are available by Ferry boat. They offer audio taped tours in multiple languages. This is one of the top 10 things to do in San Francisco. Not far from Fisherman’s Wharf in San Francisco is Pier 39. San Francisco Pier 39 offers fun shops and dining along the San Francisco Bay. Here you can buy kites, ice cream, candy, clothing and specialty items. 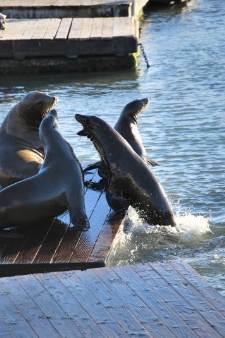 Families with kids enjoy the street vendors, and seeing the colony of San Francisco sea lions basking in the sun on the empty boat docks. Please don’t call these trolleys - these are the famous San Francisco Cable Cars. 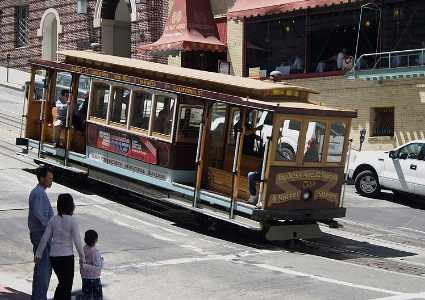 These are fun to ride and will take you to along some popular sites, including Union Square, Ghirardelli Square, Lombard street and Fisherman’s Wharf. runs through the heart of the city. 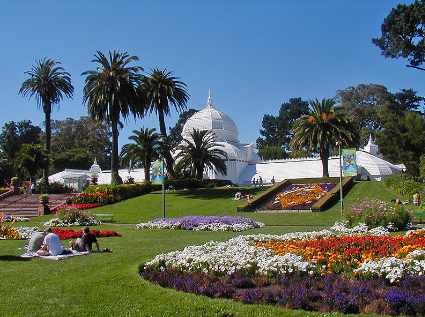 Here you will find three of the best San Francisco Museums: de Young Museum, California Academy of Sciences, the Legion of Honor, and the Japanese Tea Garden. At the western end you can walk to the Haight Ashbury district, where the hippie movement was born. is the heart of the downtown San Francisco shopping district, with big name stores like Macy’s and Niemen Marcus. The area is also near the theatre district, where you can choose from many plays. On Powell Street at Union Street is a place that sells discounted and half price tickets to the theatre for live shows that evening. This is a great way to pick up cheap tickets and experience some great theater in The City. During the Christmas and New Years holidays, the area is sparkling with lights, decorations and shopping galore! 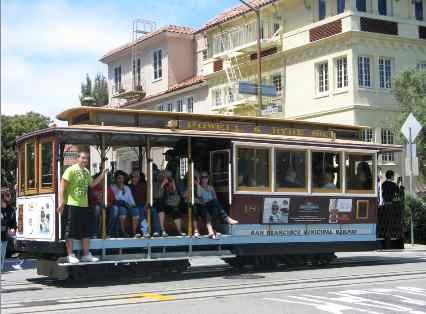 is one of the popular San Francisco tourist spots. This old chocolate factory is now refurbished as shops, restaurants and still houses the Ghiradelli Square ice cream parlor. You can see and smell the yummy chocolate being made in the back of the ice cream parlor. On weekends, holidays and summer months you may have to wait an hour to get in. If you take a ferry ride on the bay at night, you will be rewarded with a spectacular view of Ghirardelli Square from the water. 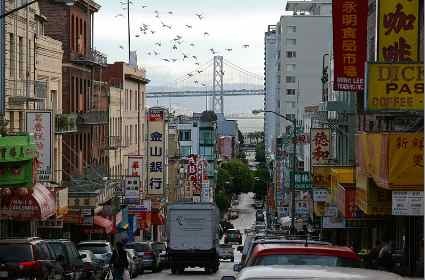 Many residents in San Francisco are of Chinese descent. One of the unique aspects of San Francisco is the celebration of diversity in its neighborhoods. The heart of Chinatown is along Grant Avenue. There are many fine Chinese restaurants in this area, so stop by Chinatown for dinner one evening.